Here is a list of common questions we get at Saint Mary-of-the-Woods College. If you can’t find the answer to your question here, feel free to contact us. Do you have to be Catholic to attend SMWC? No, there are no religious requirements for admission or enrollment. Less than 30 percent of our students are Catholic. We welcome students of all faiths. Typical enrollment for any given year is around 1,000 students. Of that number, approximately 440 students are in the campus program in Saint Mary-of-the Woods, Indiana, 360 are enrolled in online courses, and 200 are graduate students. Saint Mary-of-the-Woods College was founded in 1840 by Saint Mother Theodore Guerin. Read more about the College’s history. Does the College have any athletic teams? Yes, the College has 9 sports and 13 teams for men and women, including basketball, cross-country, equestrian, golf, soccer, softball, track & field, and volleyball. Learn more about our athletic programs. 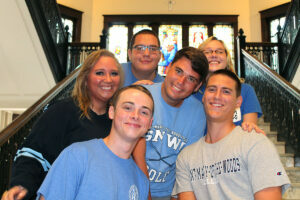 What are the admission standards at SMWC? Whether you are considering to be a campus, graduate, online, transfer or international student, you can review the admission process and requirements for Saint Mary-of-the-Woods College online. 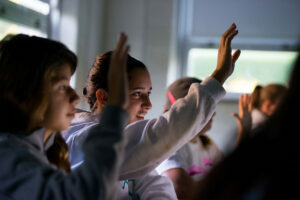 You can review tuition costs and fees for Saint Mary-of-the-Woods College online. Remember, financial aid and scholarships are available. Yes. Security guards are on our campus in Saint Mary-of-the Woods, Indiana 24 hours a day. Are medical services provided on campus? Medical services are offered through the on-campus Health Services Clinic. The clinic provides exams, immunizations, screenings, over-the-counter medications and more. The costs for these services are covered by tuition and fees for campus and commuter students. Do you have private rooms available at the dorms? Although private rooms are available, they are reserved for upper class students. 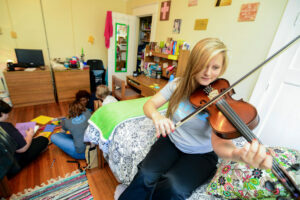 First-year students are required to share rooms to encourage involvement with other students. Yes, anyone may have a car on campus. All students with a car on campus must register their vehicle each academic year by purchasing a hang-tag for identification purposes. Students should take care not to park in areas reserved for faculty, staff, administration or visitors. No, students do not have a curfew. Is there a fitness center on campus? Yes, the Knoerle Center is a state-of-the-art fitness center at Saint Mary-of-the Woods College. It also boasts a collegiate regulation-sized gym, a practice gym for auxiliary revenue and intramural sports, a 3,600 square foot lobby, locker rooms, a training room, offices and ample storage space with the entire facility totaling over 45,000 square foot. Saint Mary-of-the Woods College offers more than 25 majors to choose from. The ratio is 13 to 1. Some classes may have up to 30 students. The College employs 55 faculty members. Are the professors members of a religious order? No, our faculty members are a diverse group of individuals from all faiths and backgrounds. Do you have internship programs? Yes, the Career Development Center at Saint Mary-of-the Woods College plays a major role in assisting students with internship programs. Internship programs can be completed during the school year or during the summer. Does the Woods Online program require previous college experience? No, approximately 35 percent of new students begin with less than 15 hours of transfer credit. Is a degree earned through the Woods Online program accredited? Yes. SMWC is accredited by The Higher Learning Commission. Learn more about our accreditations. What can I expect in a typical online class? Online courses contain the same course material as our campus-based courses. In our distance format, evaluations are made based on written submissions, projects, assignments and online quizzes. Access to campus resources, online tutoring, support systems, mentors and other online students. Are there alternative ways to earn college credit? You may earn college credit in a number of ways including transferring college credit, prior learning assessment and College Level Examination Program (CLEP). Can I take campus classes as an online student? Yes. Students are allowed to take campus classes at SMWC, if available.